What is a Haugh unit? A unit for describing egg freshness, based on the thickness of the albumen. Symbol, HU. Named for Raymond Haugh, who suggested it in 1937. Notice the mirror at a 45° angle beneath the glass plate on which the broken egg lies. The mirror permits the bottom of the yolk to be examined. To make a Haugh unit measurement of an egg, it is brought within a specified temperature range, weighed, and broken onto a flat plate. 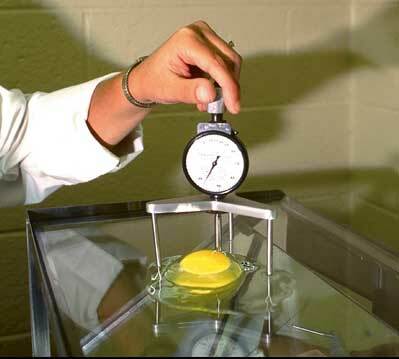 The height of the albumen midway between the yolk and the edge of the albumen is then measured with a tripod micrometer. A comparison of this height with the weight of the egg yields a whole-number score, typically between 20 and 100, or somewhat more. (Slide rules for making the comparison are commercially available, and the comparison may be built into the scale of the micrometer.) Scores of 90 and above are considered excellent, 70 is acceptable, and buyers generally reject eggs that score below 60. In United States egg grades, AA grade eggs score 72 HU or higher, A grade, 60 – 72 HU, and B grade, lower than 60 HU (all measured at a temperature between 45°F and 60°F). The Haugh unit for measuring egg quality. A description of the Haugh procedure is on folio pages 34 and 35 (PDF pages 38 and 39). William R. Stadelman and Owen J. Cotterill, editors. Egg Science and Technology. 4th edition. New York: Food Products Press, 1995. Last revised: 17 March 2006.